JAND is now indexed by Scopus and Z-math! The interdisciplinary journal publishes original and new research results on Applied Nonlinear Dynamics in science and engineering. The aim of the journal is to stimulate more research interest and attention for nonlinear dynamical behaviors and engineering nonlinearity for design. The manuscripts in complex dynamical systems with nonlinearity and chaos are solicited, which includes physical mechanisms of complex systems and engineering applications of nonlinear dynamics. 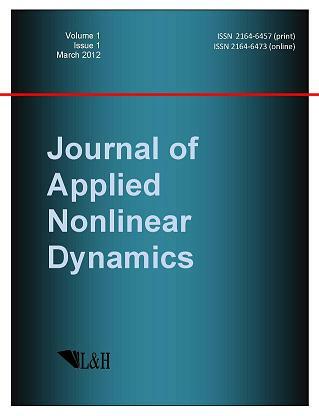 The journal provides a place to researchers for the rapid exchange of ideas and techniques in nonlinear dynamics and engineering nonlinearity for design. No length limitations for contributions are set, but only concisely written manuscripts are published. Brief papers are published on the basis of Technical Notes. Discussions of previous published papers are welcome. Audience Physicists, Engineers, Mathematicians, Earth and Environmental Scientists involved in Nonlinear Science and Numerical Simulation.